In the Fall of 2018, with funding support from the Municipal Asset Management Program (which is delivered by the Federation of Canadian Municipalities and funded by the Government of Canada) NSFM partnered with ClimAction Services Inc. to offer two workshops aimed at enhancing local asset management practices by providing municipalities with the information and tools they need to include climate considerations into their long-term infrastructure planning. To facilitate the understanding of how to integrate climate considerations into asset management planning, ClimAction Services worked with WSP to develop a paper that lays out a framework for implementing adaptive measures to ensure assets are designed, build, operated and maintained to reduce risks and be more resilient to our changing climate.Integrating Asset Management and Climate Change – A Path Forward provides a 6-step approach for integrating climate change considerations into asset management planning, which will help position municipalities to take the necessary steps to proactively adapt their assets to climate risks. NSFM has developed two online resources to support municipalities in understanding and implementing sound asset management practices, which will help them make informed, proactive infrastructure and budget decisions based on the priorities and needs of their communities. The sole reason municipalities exist is to provide services to residents, such as clean drinking water, safe roads, opportunities for sports and recreation, and countless other benefits that support our quality of life. However, much of our infrastructure needs renewal or replacement, which will increase future costs to municipal budgets. That’s why it’s important for municipalities to implement asset management practices so they can make effective and informed decisions, manage risks and plan financially for the maintenance, renewal and replacement of their infrastructure. Municipalities are already practicing components of asset management in their daily operations but having an asset management process in place helps them plan long-term, so residents can have the services they need and have come to enjoy. Smart planning ensures that infrastructure investments are beneficial now and in the future. 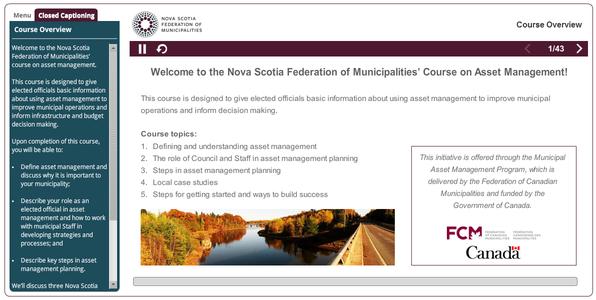 Learning online about asset management has many benefits and NSFM’s courses provide a flexible option for elected officials and municipal staff to learn at their own pace. They can proceed through the material at their leisure, pause at any time, pick up where they left off and review parts of the course already covered. This makes it easy to fit learning into busy schedules from the comfort of home or anywhere Wi-Fi can be accessed. Learning about asset management is as simple as opening your computer or tablet: there is no dress code, it requires no driving, and there is no final exam! To learn more about these courses, click here. These initiatives are offered through the Municipal Asset Management Program, which is delivered by the Federation of Canadian Municipalities and funded by the Government of Canada. The Nova Scotia Asset Management Program continues to make progress to support municipalities with their infrastructure planning efforts. The Program, developed in collaboration with the Nova Scotia Asset Management Working Group, aims to provide tools and resources that help lay a foundation for making informed, evidence-based decisions to manage municipal assets. In the spring of 2017, the Province launched the first Nova Scotia Asset Management Pilot Project, which supported five municipalities (Mahone Bay, Port Hawkesbury, District of Argyle, Town of Shelburne and Lockeport) in collecting, assessing and maintaining relevant infrastructure information for linear assets (including water pipes, sewer lines, roads, sidewalks, and trails etc.). This project resulted in the development of data collection tools and resources (i.e. a linear data collection spreadsheet and an accompanying standard operating procedure guide with a preliminary condition assessment guide) intended to support Nova Scotia’s municipalities with infrastructure planning by providing guidance for collecting asset data in a standardized way, which is the first key step towards effective asset management. The tools and resources from Phase 1 were made available to all municipalities* (upon request) in August 2018, including interim technical support. The Province is in the process of launching a second Pilot Project, which is intended to continue to provide funding support for municipal (linear) data collection. Working with the Municipality of the County of Antigonish and the Town of Antigonish in this second phase, provides the opportunity to test the existing data collection tools and resources within a larger rural municipality as well as further explore potential regional collaboration benefits. The Province has also allocated funding to support the development of an asset registry, based on the tools and resources developed from the first Pilot Project. To goal of the asset registry project is to provide our municipalities with a “one stop shop” system to house, maintain and map asset information, and access preliminary state of infrastructure analytics (to further support informed, evidence-based decision making). Similar to the Pilot Project, the Registry Project is also being developed with a phased design structure (incorporating existing Provincial IT/geomatics infrastructure and resources). The first phase of the registry project is currently expected to be rolled out to municipalities in late fall. This will provide “viewing” capabilities for municipalities that collect data using the Nova Scotia tools and resources. Subsequent phases of the registry are expected to include data editing, mobile data collection, data maintenance and analytics components. Please stay tuned for updates. Ultimately, the outcomes the current Nova Scotia Asset Management Program initiatives (i.e. both the Pilot Projects and the Asset Registry) are intended to support the continued development of a standardized methodology for collecting data and assessing the condition of assets, incorporating lessons learned and industry best practices. * If you would like to receive the linear data collection package/associated instructions (including, additional program background information as well as contact details for interim technical support), please contact Jennifer Duncan, Engineer, Department of Municipal Affairs at . The long-time practice of short-term decisions about investment, maintenance, and renewal of asset is not sustainable. The time has come to quantify the true cost to provide, maintain and renew community-owned capital assets and balance it against the community’s willingness to pay for these services and assets. In this session, Christina Benty outlines the role of municipal staff in asset management planning to support informed decision-making. She also provides sound advice and best practices on how to communicate the reality of the current state of a municipality’s infrastructure to its elected officials. This initiative was offered through the Municipal Asset Management Program, which is delivered by the Federation of Canadian Municipalities and funded by the Government of Canada. Local infrastructure provides the foundation for the health, well-being, and economic prosperity of communities across the country. Dependable core services, such as water, sewer, transportation networks, fire halls, recreation amenities, and more, make up the built environment and exist to provide services that residents rely on every day. In this session, Christina Benty, a former mayor and councillor, explains why adopting sound asset management practices is essential to sustainable and fiscally-responsible service delivery. She also outlines the role council can play in supporting the adoption of robust infrastructure practices and provides useful tips for facilitating the public’s understanding of the importance of proactively managing municipal assets. Regardless of size or location, municipalities across Canada are seeking options to support their infrastructure planning efforts, recognizing that sound asset management practices will allow them to provide sustainable service delivery, manage infrastructure risks and meet fiduciary responsibilities. Whether they have yet to begin asset management planning or are very seasoned in systematically managing their public infrastructure, many resources exist to assist them in making strategic infrastructure decisions. One important program to support municipalities with infrastructure planning is the Federation of Canadian Municipalities’ (FCM) Municipal Asset Management Program (MAMP), launched in April of 2016. The program is delivered by FCM and funded by the Government of Canada. MAMP is a five-year, $50-million dollar program designed to provide municipal decision-makers with the tools, training and knowledge necessary to make effective and informed infrastructure decisions, and plan financially for the renewal and replacement of their assets. As Canadian municipalities are diverse and have varying levels of capacity to undertake asset management practices, MAMP provides a variety of training opportunities and resources, many of which focus on small and rural municipalities. If you are interested in learning more about infrastructure planning, MAMP’s Technical Working Group has curated a selection of resources from across the county. Visit FCM’s website to access these resources and for more information on asset management planning (https://www.fcm.ca/home/programs/municipal-asset-management-program/municipal-asset-management-program.htm). In the fall of 2016, NSFM worked a team of graduate students at Dalhousie University to examine the role sustainability plays in asset management planning for public infrastructure. The students developed a pdf report (687 KB) demonstrating that by applying sound environmental and sustainable management practices to retrofitting, building and maintaining assets, municipalities can reduce costs and energy use, and make their infrastructure more resilient to projected changes in climate. Ultimately, this will help them balance their infrastructure investments with environmental performance goals, while mitigating climate risks and improving service delivery. Of the many services and programs offered by municipalities - including land-use planning, and water and wastewater treatment - all involve some form of infrastructure planning. Good infrastructure planning and decision-making helps municipalities deliver quality and cost-effective services to their residents. Municipal councils have an integral role to play in the development and implementation of asset management policies and plans through their strategic leadership and oversight. This pdf article (109 KB) explores the key roles councils can play to support responsible stewardship of municipal assets. Municipal assets are essential for delivering services to residents, but asset management is not just about infrastructure; it helps municipalities plan for the future, use taxpayer money efficiently, promote economic growth, and meet the long-term service needs of the community. This article explores the basics of asset management planning: what it is, why it’s important and the key steps involved in getting started. The following are a sampling of asset management presentations given at NSFM events over the last few years.